Rite Aid CEO John Standley (’85) has helped revitalize the drugstore giant using the values he gained as a student. In 1982 John Standley’s father submitted an application for his son to attend Pepperdine University. They had just moved back to California from Pennsylvania after Xerox Corporation, where his father worked as a finance executive, had relocated the family. Standley had just completed two years of college at Penn State University and decided to take a break to think about his next steps in life. Five months later, Standley’s father informed him that he had been accepted to Pepperdine and encouraged him to reconsider his path. Entering as a junior in 1983, he signed on as an accounting major at the senior Standley’s persuasion and experienced a different kind of higher education. Today, Standley is at the helm of Rite Aid Corporation as chairman and chief executive officer, and credits his time forming mentorships with his professors and making connections with his fellow students at Pepperdine as a key ingredient to his success. After graduating, Standley remained in the Los Angeles area and utilized Pepperdine’s connections with the top eight accounting firms at the time to begin working at Arthur Andersen. While at the public accounting firm, he gained his first professional exposure to retailing in the chain store sector. In 1994, Standley began to move into executive leadership roles and, over the next four years, served in key executive financial positions at various retail and grocery companies, including Smith Food & Drug Centers, Ralph’s Grocery, Fred Meyer, Inc., and Fleming, Inc.
Then in December 1999, Standley, along with three of his former associates from Fred Meyer, moved to the East Coast to form a new leadership team at Rite Aid. They were tasked with revitalizing Rite Aid after the prior management team had thrust the company into a significant financial crisis. His job as executive vice president and chief financial officer was to ensure that the company returned to a financially sound state and improved earnings. After Standley and the team restored Rite Aid back to health, Standley further refined his executive credentials in 2005 by becoming CEO of Pathmark Stores, where he helped orchestrate another turnaround. While Standley was leading Pathmark, Rite Aid had made a major acquisition by purchasing 1,858 Brooks Eckerd drug stores, a move that was designed to give the company the scale it needed to compete with its larger rivals. However, after a lengthy regulatory review and experiencing snags in the integration process, the company was looking to move forward as it managed significant debt. That’s when Standley received a call from Mary Sammons, the president and CEO of Rite Aid at the time, asking him to serve as a consultant to the company. He accepted, and his immediate contributions and prior experience soon prompted Sammons and the board to offer him the position of president and COO, which he assumed in September 2008. That same month, the stock market’s sudden collapse signified the beginning of a tough economic recession that made the drugstore chain’s position even more challenging. Together, the new leadership team played an instrumental role in leading Rite Aid through another impressive turnaround; this one fueled by expense control, operational efficiency, key refinancing transactions, and a new wellness- focused brand anchored by the company’s Wellness+ customer loyalty program. The company continued getting stronger as Standley was named CEO in 2010 and chair of the company’s board of directors in 2012. Last year Rite Aid delivered a profitable full-year performance for the first time since 2007. With escalating health care costs and the emergence of the Affordable Care Act, Standley maintains that retail pharmacy is uniquely positioned to play a big role in how health care delivery evolves in the country over the next several years. 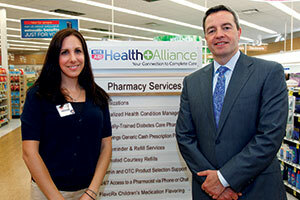 His vision for Rite Aid is not only focused on running a convenient front end of the store, but also thinking strategically about the role of pharmacists and pharmacies in communities. One of Rite Aid’s latest initiatives is building an integrated care model, Rite Aid Health Alliance, which connects physicians, specially trained care coaches, and Rite Aid pharmacists to work together with specially identified patients to help them achieve specific physician- identified wellness goals and improve their overall health and self-management abilities. Rite Aid will also add RediClinics to a large number of stores over the next few years in order to address acute conditions such as flu and strep throat, and also to provide physicals in-house. As the current chair of the National Association of Chain Drug Stores (NACDS), he also helps drive the mission of advancing community pharmacies and helping establish opportunities for their expansion and success.